Spoon yogurt into 1-quart ice cream freezer. Spoon honey over yogurt. Freeze according to manufacturer’s directions. Yogurt will be the consistency of soft-serve ice cream in about 20 minutes. Meanwhile, place raspberries in blender container. Add sugar; blend until smooth. Place small strainer over medium bowl. Using back of large spoon, press berry mixture through strainer until only seeds remain in strainer; discard seeds. Set berry mixture aside. Transfer yogurt to 1 1/2-quart plastic container. Drop spoonfuls of berry mixture onto yogurt. With kitchen knife or spatula, gently swirl berry mixture into yogurt. 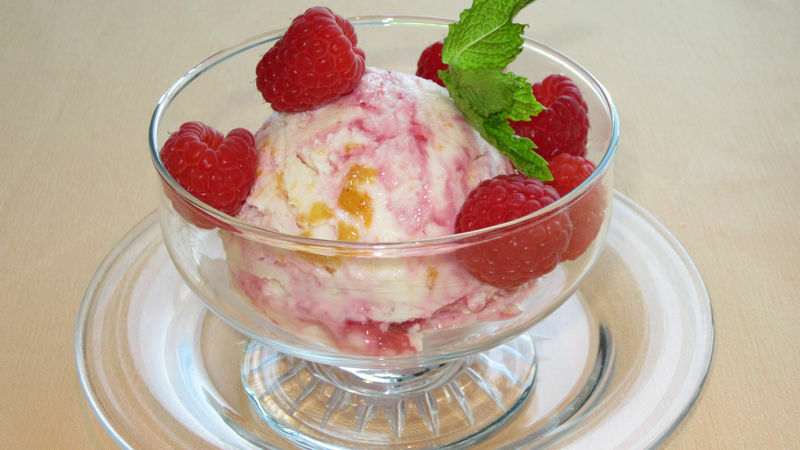 Garnish each serving with a few fresh raspberries and a mint leaf. Serve immediately or store covered in freezer.